GOOGLE PANDA 4.1 – THE GOOD, THE BAD AND THE PENALTY! Earlier this day, Google started rolling out the most anticipated algorithmic update, the Google Panda 4.1, although it was Panda 5.0 that almost everyone expected. So what could be the impact of this new update? Would it boost the websites who write of loyalty or those who possess loyalty? No matter what, with the roll out of Google Panda, webmasters are awestruck and wondering what this mighty beast could have for us all. Google Panda 4.1 algometric update is designed to penalize websites comprising of poor and thin contents. How Google uncovers the Good, the Bad and Penalizes the bad? When Google rolled out Google Panda 4.0, almost 7.5% of English queries on the Google Search had tremendous impact, accumulating lots of websites to its fall. Websites that made the reasonable changes can expect a drastic boost in traffic, but for those who are new to the online realm can obviously witness a downfall, if not now then later, unless they follow the Google guidelines. Google categorizes the good based on the Behavioral phenomenon of users towards a desired website of their choice. If a user searches for a query and lands on a page that is not relevant or unfavorable to his query or need, he/she will bounce back. Each of these bounces will add to the loss of the website’s rankings by 1, and if the website is favorable then it adds to its rankings by 1. Points Based Algometric System is the insightful concept behind the ranking system of Google that is technically crafted based on several factors. These bounces happen due to poor quality of contents/articles or due to poor keyword research. Hence any websites that fall under this category can expect a steep drop in traffic in the near days to come and Panda 4.1 is sure to mercilessly penalize any websites that stumbles on its way. Google Panda Penalty opens door to several websites to revoke from the hit. Some possible solution to this is to optimize the website with high quality contents. Panda will devour on Plagiarism! So beware and use unique & fresh contents. Best advisable to have a minimum of 300 words on articles posted on websites, which will in turn add to the benefit of your website and for serving users with high quality information. This will as well alleviate the bounce ratio of your websites. 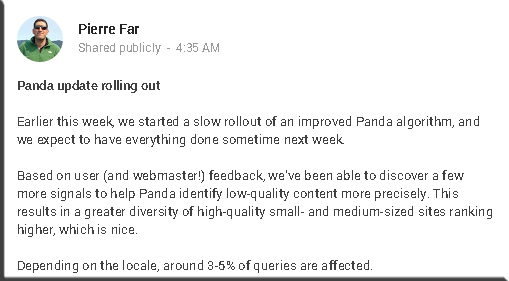 Panda 4.1 is Google’s 27th Panda Update designed with a motive on Redefining Quality! Although Google is on the process of rolling out the Panda update, we can’t precisely measure the traffic of our websites. We may witness constant surges in traffic until Panda takes its toll on websites worldwide. But until then, it’s always advisable to patch up your websites and keep it fresh & updated to the standards of Google. Emphasize of high quality contents and be spared by the ugly penalties of Panda! Previous PostPrevious SEO ranking factors for 2014: Content continues to be the king, but user signals are vital! Next PostNext An insight how local SEO can help your business grow!